The postings on this site are those of developers working on Rational Team Concert and don't necessarily represent IBM's positions, strategies, or opinions. I've been poking around the OSLC APIs recently. First to build a Slack bot that can explain work items when they're mentioned in a channel and second to order open work items by the number of subscribers. There's a bit more work to be done on the slack bot, but I feel like I can expose my script for ordering work items by subscriber count. There are a few hardcoded values that users may want to change, but the general shape of the solution is there. Note the hard-coded project area ID around line 212 and category name on line 202. You'll probably want to change those. The OSLC documentation on the jazz.net wiki explained how to login and perform work item queries from the REST API. A forum post on getting work item categories via the REST URIs explained how to traverse the categories for the query. The SCM CLI is available from jazz.net downloads page under the "Rational Team Concert," which is the bug tracking and source control portion of JazzHub. You use the same credentials here as you use for JazzHub. From there you can pick a release (preferably the latest) and go to the "All Downloads" section. You can go back periodically to get new versions of the CLI. JazzHub is compatible with the latest release of Rational Team Concert but not the milestone releases (M1, M2, RC1, ...). If you don't want to upgrade you can generally use the CLI from previous RTC releases with JazzHub. If you are using a 64-bit system or you would like more details check out this article. 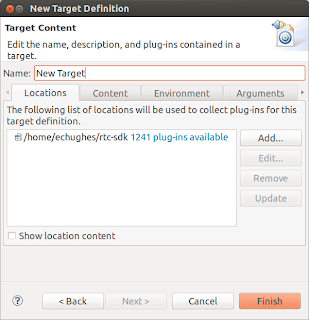 Download the "Client for Eclipse 3.6.x IDE" for Linux from the downloads page above. 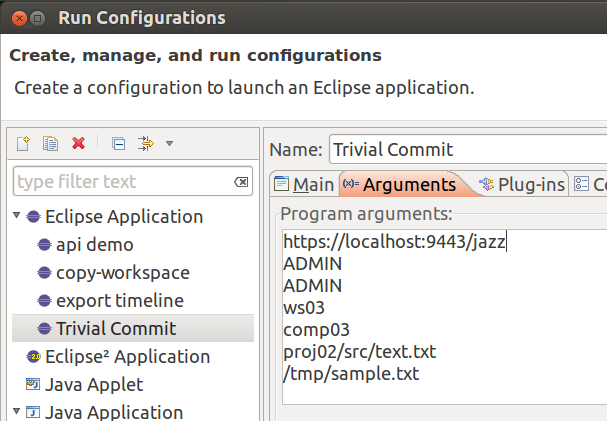 The CLI is bundled with the Eclipse IDE. You don't have to use the IDE if you don't want it. Unzip it and add the "jazz/scmtools/eclipse" directory to your path. For example, if you are on Windows you can add to the path using the Control Panel \ System Settings \ Advanced Settings \ Environment Variables dialog by adding ";C:\path-to-unzipped-folder\jazz\scmtools\eclipse" to the end of the PATH variable. After you change the system path you can restart your terminal or command prompt and run the "scm help" command to verify that the installation is correct. It should provide a list of the available CLI commands. Restart your terminal and run the "scm help" command to verify that the installation is working. Java is needed for the CLI but it is an optional install on Mac OS X. If it is not installed you should be prompted to install it when running the help command. Everyone on your team should add the same entries to their own magic file. Now that the CLI is installed you can begin working with your JazzHub project's source code. Many of the CLI commands need to connect to a repository. Each JazzHub project is assigned to a repository with a URL (e.g. https://hub.jazz.net/ccm01). You can find your the URL in the bottom right of your JazzHub project page when you click the "here's how to get setup" link. You are prompted for your JazzHub password and all of this information is cached using the nick name "jazzhub01." When you invoke CLI commands that require a repository you can use just the nick name for the "-r" parameter and save the extra typing. Unlike some other SCM systems much of your day-to-day work is normally kept in your own workspace on the server (ie. repository). Even if you are not ready to share your changes with others you are able to organize them right away into change sets. It's good to keep the changes safely stored in the repository to avoid accidental data loss due to accidental deletion or even hard drive failure. Each JazzHub project is given a name of the form "userid | projectname" with the userid of the initial creator. This is the name assigned to the project's stream. Also, notice the "-r" parameter with the nick name we created in the last section. Many of the CLI command use this parameter to refer to a repository URL or its nick name. $ lscm share -r jazzhub01 myuserid-workspace1 folderWithCode "userid | projectname Default Component"
The workspace name matches the one you used to create it in the previous section. Change "folderWithCode" to the name of the folder you want to share. The last parameter should match your project name with the "Default Component" suffix. Components are a more advanced SCM topic that doesn't need to be covered for our purposes here. At this point your source code is backed up in your repository workspace but it is not yet visible to the rest of your team. You need to flow, or deliver, the change set to the project stream so that other people can see it. If you just finished sharing your code then you can skip this section. When you want to work on an existing JazzHub project you will need to download (ie. load) the contents of your repository workspace on to your hard drive so that you can begin working with it. Create an empty folder on your hard drive, change directory (ie. cd) into it and run the load command. This command can take time to transfer all of the files, especially for larger projects. Notice that the repository workspace name is the one you used above to create it. The nick name makes the load command nice and terse. The checkin command will automatically create a new change set if necessary and add the change to it. If you want to use more than one change set at a time to organize your changes (e.g. for unit tests) you can use the create changeset command. Commands that work with change sets will show the change set ID, which is rendered as a four digit number in round brackets (e.g. "(1024)"). You use the change set ID with the checkin command to place the change into that change set. If you forget what change sets are active in your repository workspace or you want to see what files you have changed that are not checked in you can use the "lscm show status" command. The status information will also show the change set comments and work items. These bits of contextual information can be very helpful down the road. It is good practice to assign a comment and/or associate a JazzHub work item using its number. Deliver all of your change sets to the stream with the deliver command. If you want to deliver specific change set(s) you can provide the change set ID's. Other members of the team will periodically deliver their change sets to the project stream. You can keep track of these new change sets using the "lscm show status" command observing the "Incoming" section. You can flow, or accept, all of the incoming change sets into your repository workspace using the accept command. Once the accept command is complete the changes that you have accepted will show up immediately on your hard disk. The nick name has already saved a significant amount of typing so far. Some of the CLI commands have aliases to make them even more concise. For instance, you can replace the term "changeset" with "cs" in any of the commands shown above. Workitem can be shortened to "wi." Likewise, "checkin" is easily shortened to "ci." Command aliases can be found in the command's help (e.g. "lscm help create changeset"). One really useful SCM pattern is to organize your production code changes and unit test changes into separate change sets. As you are iterating on each set of changes you can temporarily suspend the production change set to validate that they fail without the production changes. When you resume them the tests should pass. You can do this with the suspend and resume commands, or "susp" and "res" if you prefer to save the extra keystrokes. When you accept change sets from the team's stream you will occasionally run into conflicts. If files are marked as registered as text (see above section) and the content changes occur in different parts of the file the CLI will attempt to automatically resolve the conflict by applying both changes to your file. If changes cannot be automatically merged then you will need to merge in the changes yourself. Check out the show conflicts command to view the different aspects of a conflict and the resolve conflict command to resolve the conflicts in different ways (mine, proposed). Hopefully, this post has provided some guidance on how to get started with your JazzHub project using the SCM CLI. There are a number of articles that cover how to use it in more depth. Another article was written recently about hacking JazzHub projects from the command line from a slightly different perspective. Now comes the fun part: committing changes to Rational Team Concert's SCM. We're going to write a program that commits new content to a file in RTC without loading it first. This isn't possible in the Eclipse, Visual Studio, or command line interfaces. Note: This post uses internal API. It may change at any moment, stranding you on a specific version of RTC. You can download a zip of the Eclipse project, or load it from JazzHub. As you know, RTC SCM has repository workspaces. Workspaces record the directory structure of source code in the repository. We refer to files and folders in the workspace as items. Whenever a user changes an item, a change set is created that moves the item from a before state to an after state. If the user modifies the content of a file, the before state in the change set has the old text while the after state has the new bytes. Internally, items have state ids that are used to uniquely identify the before and after states. Change sets are either active or complete. An active change set can be given new after states, while a complete change set cannot have new after states associated with it. To avoid ambiguity, an item can only appear in one active change set per workspace. In other words, if I want to commit a new change to some item that is already in an active change set, I must commit to the existing change set. In this example we're going to be diving deeper into the guts of the Jazz platform than usual, so you'll need to know a little about how it works. Here's a quick sketch. The RTC server stores objects. Every object has a unique item ID as well as a unique state ID. When one object references another, it does so with a handle. The handle consists of the item ID and, if the object cares about a specific version, the state ID. Implicitly both the object and handle have a type. To minimize bandwidth consumption, the RTC server and client usually exchange handles. But eventually they need to exchange real data. When that happens, the client will fetch the full object. In our example, when the client wants to learn more about a change set, it will fetch that change set. Fetched objects are immutable. The client cannot change them without getting a working copy first. Fields on the working copy may be set as appropriate, then the client saves it back to the RTC server. When the client modifies the object representing a file, it creates a working copy of that file. We'll see more and more of handles, fetches, and working copies as we explore this sample. Find the repository workspace and component named in the arguments. Find the file item in the workspace. Upload the file content to the repository. Choose a change set to record the modification. Tell the repository to set the after state of our change set to be the uploaded content. You'll notice that step three is a little weird: we upload content and then create the change set, rather than doing it in one step. Welcome to the land of implementation details. IWorkspaceConnection - the logical representation of a repository workspace available in the client side SDK. It provides handy caches and methods simplifying workspace access. IConfigurationOp - describes a change to an item in a repository workspace. The repository uses these to build change sets. We're using a 4.0.3 version of the server and SDK. Nothing here is specific to that version, so it should work with newer and older versions. Notice I say should. I'm not going to cover resolving the workspace and component names, since we've covered that before. Instead, we'll start on line 95, where we resolve the remote path. In order to commit changes to an existing item, we need to find the item's ID. Humans, the frail beings that we are, refer to files by path. But RTC doesn't care about paths and refers to files by their item ID. So we need to find the IFileItem for the path the user gave us on the command line. Line 143 performs the path query. The first argument is the root folder, which the the root of the component, and the second argument is the path specified by the user. The third argument is a IProgressMonitor - we don't care about those for this example. The return value is a handle to an IFileItem, which carries the item type, the item id, and state id. Our example is limited to dealing with files, so we use an instanceof check on line 149 to ensure that it's a file. Repository workspaces can also hold folders (represented by IFolder) and symbolic links (represented by ISymbolicLink) but those would complicate the example, so we're ignoring them. The content is read multiple times during the upload, so we can't pass around an InputStream, since the first close() would render it useless. Instead, the caller passes in a factory that allows the stream to be repeatedly opened. Our content transport layer is unadulterated HTTP 1.0. In order to use Connection: Keep-Alive, we need to know the length of the stream before we upload it. We don't use content chunking. I don't know why. We can't use the file size to determine the length, because we normalize *nix/DOS line endings on upload. Our only option is to walk the file to determine the length. The upload occurs as a single call and returns an IFileContent object. The content object is a client-side references that is used to uniquely identify file text in the repository. There are two arcane steps we must take before creating the 'after' state for our change set: we need to inflate the IFileItemHandle from findRepositoryPath() into a full item, and then get a working copy of that full item. As we said above: items are passed between the RTC server and client as a handle consisting of the item id, the state id, and the item type. Handles can be considered cross-network pointers: they're a lightweight representation that allows programmers to refer to the item without worrying about its properties. In this case, we care about the IFileItem itself, so we get the full representation on line 106 by fetching it with IConfiguration.fetchCompleteItem(). Full items are immutable, so we have to ask the item for a working copy of itself on line 107 before we can change it. Once we have the working copy, we make changes to that. The handle/full-item/working-copy trichotomy gives us some powerful tools. We can pass handles across the network quickly, only fetching the full version of the ones we care about. We can batch fetching handles, to minimize the number of network operations. Immutable full items allow long-lived portions of RTC to assume that the properties of the item haven't changed. Eventing when working copies are saved allow the RTC UI to update appropriately. Our changes to the IFileItem are minor: we just update the content and modification date. The other fields keep the previous values. The working copy of the IFileItem is the 'after' state of the file change we want to make. To get the 'after' state into a change set we create an IConfigurationOp containing the working copy. The configuration op is used to inform the repository that a change set should be updated. We have IConfigurationOps because we want a common way of talking about item modifications. Aside from the Milquetoast SaveOp, we have ops that merge conflicts, delete items, or remove them from change sets. We're almost done. We just need to find a change set to record the after state. In a truly trivial example, we would create a new change set and commit into that. But there's a restriction on commit: an item can only appear in one active change set per workspace. If we try committing it to another change set, the RTC repository will throw an exception. This use case is fairly common, so we'll handle it in selectChangeSetModifying(). To avoid the exception, we walk the set of active change sets and look for one with a change to our IFileItem. The IWorkspaceConnection knows the list of active change sets, but only records them as handles, so we convert the IChangeSetHandles into full items with the IItemManager on line 240. The IChangeSet expresses changes as IChange objects. Each of those modifies a single item, so we walk those to see if our IFileItem is already being modified.. We know that only one change set may modify an item at a time, so we're safe to return when we find the first match on line 245. There's always the possibility that there aren't any active change sets modifying our IFileItem, so line 250 creates a new IChangeSet if necessary. After the commit is over, we change the comment on the change set and complete it. We do that to make our change set easier to identify. In production code we would (probably) leave the change set open and we certainly wouldn't create such a pointless comment, since the completion time of the change set already has that information. The program takes a whopping seven arguments: the first three are the repository URI, user name and password. 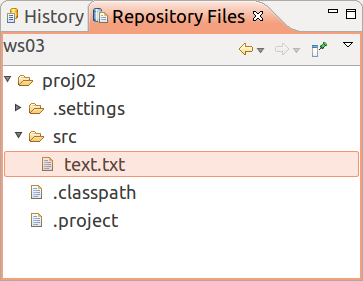 The next three are the repository workspace name, component name, and path of the item to save to. The last argument names the file that contains the bytes we want to commit. Start your repository and connect to it with the RTC Eclipse client. The file text.txt is the target of our commit. The arguments are: repository URI, username, password, workspace name, component name, path of the item to commit in the repository workspace, and the path of the content to write to the remote workspace. My initial content for text.txt is an empty file, while the content of /tmp/sample.txt is 'hello commit world'. 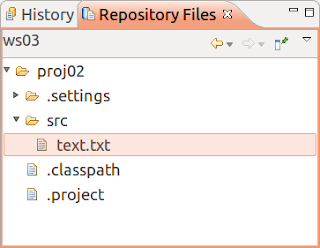 To verify your content, open the target file from the Repository Files view in Eclipse. Run the launch. It should chug for a few moments before performing the commit. Refresh the Repository Files view and open text.txt. 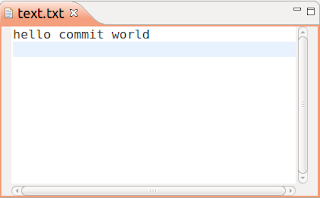 Now you have a working commit using the RTC SDK. The sample demonstrates how to find an item in a repository workspace, traverse active change sets to one that modifies a specific item, and add a change to a change set. Along the way you've learned a little more about RTC's item model. As always, comments are welcome, and the source code is available on JazzHub. Have you ever wanted to create a zip archive of a repository workspace? This post describes how to use the RTC SDK (and some undocumented internals) to copy the contents of a repository workspaces into a zip file. Let's start with some background. A repository workspace contains components, each of which has a configuration - which is a ten dollar word for "file tree." The configuration provides access to the structure of the tree and has pointers to the file content. walk the file tree to write each directory/file to our zip. This post uses unsupported API. It is likely that the APIs will change without warning in future iterations of RTC - you should use the Source Control command line tool instead. You are using these APIs at your own risk. Each step is addressed in its own section. The code samples are available on JazzHub or can be downloaded as a zip. 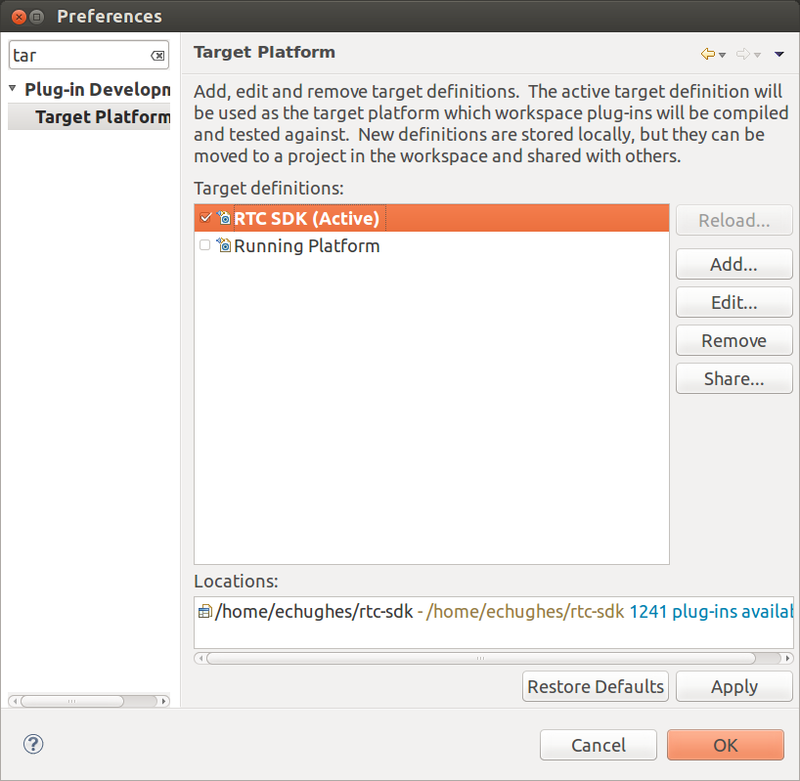 You are expected to have a working development environment with the RTC SDK and RTC server configured properly. For our example, we find the workspace by searching for one with a specific name using the IWorkspaceManager#findWorkspaces() method. The interesting classes here are the SCMPlatform singleton that allows us to get a IWorkspaceManager, and the IWorkspaceSearchCriteria. The workspace manager answers simple queries about workspaces, as well as providing access to IWorkspaceConnections, that we will learn more about below. The IWorkspaceSearchCriteria allows us to build a query that matches a number of workspaces. The query fields are implicitly and'ed together to limit the workspaces returned. In an ideal world, we'll find exactly one workspace that matches our criteria. Searching by workspace name is useful for our example, but it isn't the safest thing to do in a production environment, since there could be multiple workspaces with the same name. In production UI code, we would present the user with a choice of workspaces. If the code were headless, we would use the ID of the workspace we care about. Because we want a modicum of correctness, our example ensures that there is exactly one visible workspace with the given name (lines 68-76). The findWorkspaces() method returns a list of handles to the workspaces matching the criteria. A handle is a lightweight object that identifies an item in the repository. We'll use the handle later on to query the workspaces. Once we've found the IWorkspaceHandle, we need a richer representation to query the file tree. We do that by converting the handle into an IWorkspaceConnection (see line 78, below). The IWorkspaceConnection provides operations on a repository workspace, and caches information about the workspace. Now we have the connection, we start digging into the structure of the workspace. The topmost layer in the logical tree consists of components. Components split remote workspaces into logical groupings of files and folders. They aren't normally represented in the local filesystem when loaded, so our zip creator won't record them in the zip. // queue of stuff to download. We're finally here! The fun part that involves getting file content from the repository. Unfortunately, this is also where we diverge from the supported API. In our last code snippet, you'll notice that we got an IFileContentManager on line 81. Sadly, that isn't part of the API anyone outside of the SCM Core is supposed to use. If you do use it, be aware that the class could change in future releases. You use it at your own risk. With the legalese/honesty out of the way, let's look at how we use the forbidden API. Our loadDirectory method is called recursively to write the content of each directory into the zip file. It takes a list of IVersionable items as an argument. An IVersionable is the superclass of the things that live in a filesystem: files, folders, or symlinks. It is possible that other types of items could exist in the configuration - but let's pretend they don't, because, for the most part, they won't. The fun part is on line 146 where we ask the (forbidden) IFileContentManager for the content of the file. We pass in the IFileItem as well as its IContent, which is a pointer to the blob of bytes stored in the RTC repository. The remainder of the block is anticlimactic: copying the content with a regular Java stream idiom. Even though the file content portion of this example is forbidden API, the example helps to show how to use our APIs. The pattern of logging in, finding a workspace, and then using the IWorkspaceConnection to perform some operation may be useful in other contexts. The example doesn't begin to get into the practical complexities of getting content (normalizing line endings, storing file properties, handling symlinks), or the problems faced when merging into an existing filesystem. You can download the full Eclipse project or poke at the project on JazzHub. Last night I was poking around trying to figure out how to write a demo with the Rational Team Concert SDK. My first attempt failed. It wasn't until I found Ralph Schoon's excellent blog post on using the SDK that I finally figured out how to do it. 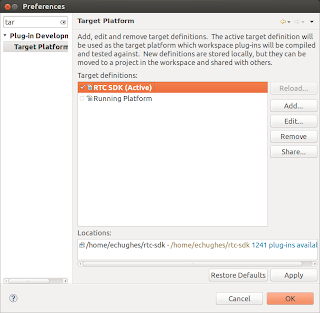 Download the RTC SDK and server. At the time of writing, 4.0.3 is the most recent release, so you might as well grab that. Extract the SDK to ~/rtc-sdk. Start Eclipse on a fresh workspace. Open the Eclipse preferences and search for the Target Platform page. Click "Add" to create a new target platform. Initialize it with "Nothing." Add an Installation. Point it to ~/rtc-sdk. 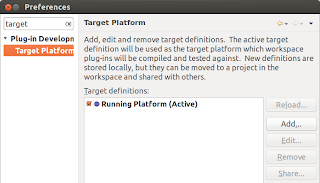 Set your target platform as default. You're done! 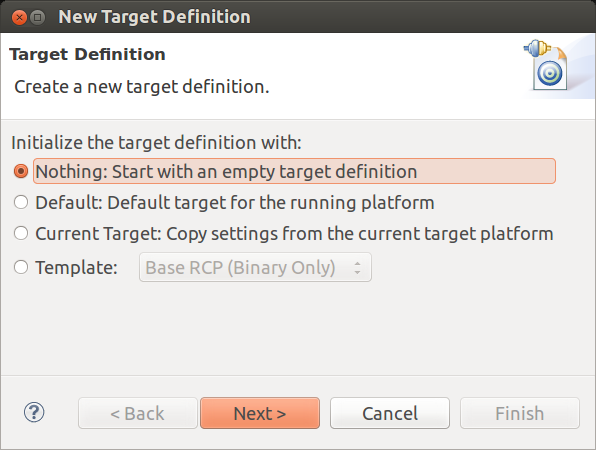 You can now write programs that use the RTC SDK. To verify that your Eclipse is properly configured, download the attached project, and copy it into Eclipse. Get your server configured and started, then edit Start.java to use the URI of your server and credentials of the user you created. When should you start using a source control? My eyes were immediately drawn to this thread on Ars Technica: "When should I make the first commit to source control? ", with answers from Stack Exchange users. A source control doesn't have to be in the way of your dev work. It knows when you save files, and in many IDEs and products out there, it even knows what task or defect you are working on. It can work in the background, safely pushing your changes from your local drive to a remote machine, so you can crash your hard drive or pursue your work from a separate machine in the evening. A source control is now a basic feature like syntax highlighting, code assist or refactoring. It's a given that whatever you've done, you can review and roll back in time, fork and try something else. Suspend your current work, resume some other on-going work. Work with a buddie, with a team. And when you can do all that without thinking about having to use a source control, then we've succeeded. The first tip I give about using a source control is to check-in frequently. By that I mean storing your changes frequently in the source control, which isn't the same as giving every one of your changes to your team. Many source controls have a staged approach - you can version control your own changes in a private way then control when you find them useful and good enough to be shared with others. In the 8 years of RTC Source Control, we tested different source control workflows. In the early days, we were really keen on something called auto check-in. In 1.0, that feature was on by default. You save a file. Bing. That change is safely backed up on the RTC server, in your private workspace. Some of us were wondering - why bother asking the user when to manually check-in? Why not doing it automatically for every file that is modified? It turned out to be a very divisive matter. Some really thought that was the way of the future - just have every change you do automatically be replicated in your backup on the server. And others really wanted to stay in control as to when their changes leave their local drive and become part of the source control's memory. I was initially a strong proponent of the auto check-in workflow. I always thought the ones opposing it were a bit like the mathematician Gauss as described by Abel: "he is like the fox, who effaces his tracks in the sand with his tail". Like you don't want others to know all the wrong paths you've explored before you actually perfected the fix for a defect... That's too bad, because e.g. 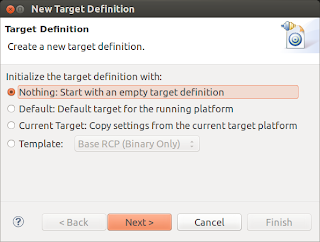 RTC Source Control has a way to highlight the initial and final versions in a change set and make the intermediate versions mostly hidden in regular operations. So why did we turn off auto check-in by default? Because many users were hit by some of its drawbacks. Big mess when a mistake you do in your IDE refactors 1000 files. I did experience all these annoyances myself and was convinced that it wasn't appropriate for a majority of users in its current form. It's fantastic for those users who like the convenience and remember to complete their change sets at appropriate stable moments. I don't use auto check-in anymore. But I frequently check-in my changes so that I can easily go back to a previous good state, and in RTC we make it easy with a simple "Check-in all" button. I only deliver my changes to the stream used by my team when it's ready - after a green personal build for example. If the source control you use makes a commit sound like a complicated, slow and cumbersome task to perform, you're likely missing the greatest strength of a source control. It's invisible to you when things work, and it's there when you need it. So, in conclusion, next time you create a project, put it under version control right away... Version control is good for you even if you don't intend to share with other peers right away. For some of us working in RTC SCM, it's a big snow day, we're not just dreaming about a white Xmas :-) For our developers in locations where snow is a rarity, you cannot imaging the joy of clearing up your drive way... This said, time to reflect on what we've done and published for our RTC users. Since the articles and videos we listed last July and August, much more has happened in the last five months. For CLI users, check out these three videos from Shashik and Sridevi. If your source code base is large - or should I say, huge - and you have to deal with many variants, you want to carefully think about how to organize it in your SCM. Here are tips illustrated with the popular Android OS code base, from John. How you use your source with your local tools and how you version it in RTC can be straightforward or very sophisticated. These two articles go to great depth in load workflows. Yes, process is built-in with every component of RTC - Work Item, planning, build and of course source control. If you're a scrum master, component lead or project manager, this article from Evan is a must read. And if you want to upgrade to the latest version of your VS IDE, we got it covered... Vandana gives an overview there. For tips on how we review changes when fixing defects and how we set process conditions to ensure appropriate reviews are in place, have a peek at this blog post from myself, and its two videos. Getting Swagger API Pages for Watson APIs - I miss those Swagger API pages for the IBM Watson services - so I found out how to get them.